The RPC is collaborating with The Carle Foundation to support a new Job Readiness and Learning Program. 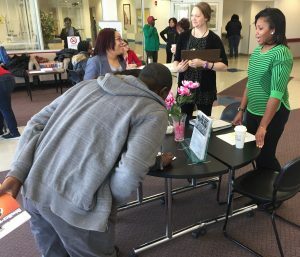 Carle interviewed a number of candidates for the eight-week paid program on January 30, 2018, during a healthcare recruitment event at the Illinois workNet Center in Champaign. The Center is home to the RPC’s federally funded Workforce Development program. Carle’s Job Readiness and Learning Program, which begins on March 5, 2018, aims to accept 10 initial participants. The program is the first of a number of planned healthcare-related academies that will be supported through this public-private partnership. Members of the RPC’s Workforce Development program welcome candidates to the learning event on January 30 in Champaign. healthcare sector offers career paths that lead to generous compensation and a secure future,” she explains. She also points out that in the latest 10-year projections for industry growth from the Bureau of Labor Statistics, dating from 2014 to 2024, the health care and social assistance industry is forecasted to produce one in three of the net new jobs in the United States. Healthcare programs like Carle’s Job Readiness and Learning Program aim to provide eligible participants with job-driven training, tools, and access to career pathways that lead to permanent, sustainable employment and ongoing career advancement. Public workforce development funding from the RPC will leverage private Carle Foundation funding in an effort to expand workforce training and support services with a focus on in-demand entry- and mid-level healthcare positions in our community. 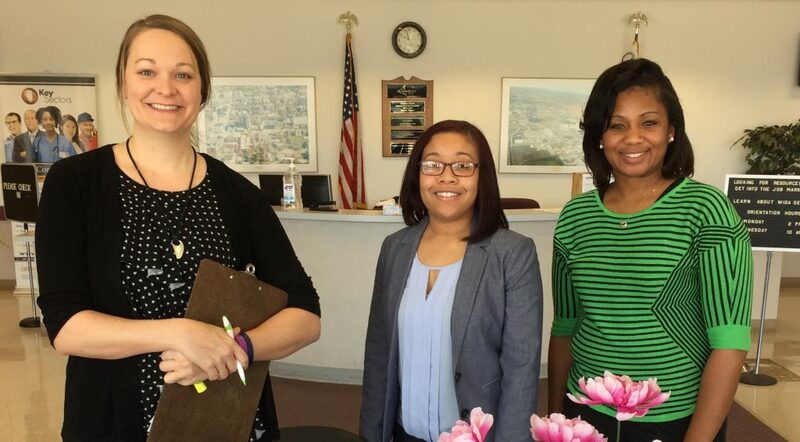 “With Carle being one of our largest employers, it is amazing to see how this unique training program will provide stable employment opportunities for so many of our clients,” says Toriana Rhone, the RPC’s Workforce Development Manager. The 10 candidates chosen will benefit from paid employment with benefits, a positive team environment with supportive managers, and a support system for both personal and work goals. “Our goal for this special Job Readiness and Learning Program is to create a pathway toward successful employment at Carle,” says Lauren Schmid, Carle’s vice president of Human Resources. “For individuals interested in working at Carle, this is a great opportunity to blend their interest in working at Carle with building valuable work skills. In partnership with the RPC’s Workforce Development program, we are able to support individuals not only through the people at recruitment events and beyond, but into employment, as well, for those chosen for Carle’s Job Readiness and Learning Program.” Schmid adds that the health system, which includes Health Alliance Medical Plans, recently earned national Great Place to Work in Healthcare for 2018 honors. During their third week in the program, participants will begin on-the-job-training in their assigned department, which includes meeting other team members while learning the job and the leader’s expectations. Upon completion of the eight-week program in May, participants will be placed full-time in the positions for which they were hired (Environmental Services, Food Services, or Sterile Processing Distribution). After six months of successful employment, participants/employees become eligible for participation in other classes and growth opportunities at Carle. Check-ins between the coach, managers, and participants continue through a participant’s first year of employment. These check-ins will focus on the progress being made toward career and personal goals, while connecting with other related resources along the way. The program’s classroom work features a variety of activities that can be applied quickly and carried through to on-the-job-training and future work. Sample activities include brainstorming, conversations, demonstrations, videos, journal writing, games, problem solving, role-playing, and simulations. Among the topics covered are Connecting Through Communication, Customer Service, Career and Personal Goal Planning, Time Management and Organizational Skills, Teamwork, Work-Life Balance, and Clinic and Hospital Setting Operations. Candidates selected by Carle for the Job Readiness and Learning Program are encouraged to also participate in the RPC’s federally funded workforce development services. If eligible, they will have access to supplemental supportive services to assist them in addressing barriers that may affect their employment, such as childcare and transportation needs. “The RPC’s Workforce Development program is a wonderful opportunity for both individuals and businesses. We strive to prepare eligible youth, adults, and dislocated workers for entry/re-entry into the labor force,” Rhone says. The RPC and Carle plan to co-host a number of additional recruitment events in the spring and fall of 2018 for selection into a number of Carle learning academies. I would love to check further into this! I need more information in how to get set up with this Program Partners with Carle Recruit. Sandy, you can pre-register for the next event by contacting Sarah at Carle at 217-531-8279. You can also apply online at http://www.carle.org/career. Thanks a lot for providing individuals with such a nice chance to discover important secrets using this website. It’s always very nice plus jam-packed with a great time to me and my office peers to search your blog no less than three times in one week to determine the new guidance you have. Of course, we are certainly amazed with the stunning solutions served by you. Some 2 areas in this posting are in reality the best option we’ve ever acquired. I am interested in getting in this program to further a career at carle hospital (something I’ve try to pursue on and off for quite some time now), I am having trouble finding the link to apply online for the program. If anyone involved could be so kind as to contacting me back with info on how obtain the application that would be so greatly appreciated thank you!